Status: Uncommon regular spring and fall migrant west and central, rare east. Uncommon regular breeder west and southwest, rare elsewhere. Rare casual winter visitor south and east. Documentation: Specimen: UNSM 7719, 30 Apr 1903 Elm Creek, Buffalo Co.
Taxonomy: Worldwide taxonomy is in flux; 29 subspecies are recognized by various authors (Clements 2016, Gill and Donsker 2017). The latter authors recognize recent genetic studies that found three major clades among the 29 subspecies, thus recognizing (with reservations) three species: Western (T. alba), Eastern (T. javanica), and American (T. furcata) Barn Owls. This treatment has not been adopted by the American Ornithological Society as of 2017. Only one subspecies occurs in North America, pratincola (Pyle 1997). If Western Barn Owl (currently T. alba furcata) is elevated to species status, North American birds become T. furcata pratincola. Nebraska birds are pratincola. Changes Since 2000: The frequency of nesting reports in northeast Nebraska has increased since 2000. There were no reports of nesting in that part of the state for over 100 years until 2005, since when there have been at least five, with at least one site used for more than a single season. Arrival is in late Mar, although there are earlier reports which may be of wintering birds. Almost all Nebraska reports are in the period Apr-Oct. One had arrived at a cliff nesting site in Scotts Bluff Co 28 Feb.
Summer: Barn Owl occurs statewide in summer; highest densities occur in the southwest and westward in the North Platte River Valley, with fewest reports from the northeast. There had been no nesting records since 1900 from north and east of Holt, Boone, and Platte Cos (Ducey 1988) until 2005, but since then there have been several. This change may be due to recent warmer winters allowing wintering and/or breeding further north and east. 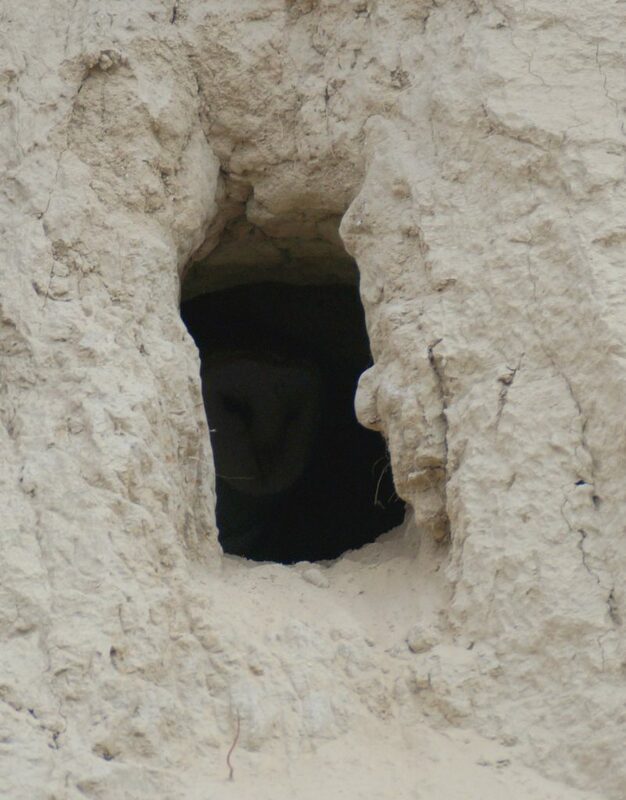 Recent surveys (Olson 2009) have found Barn Owls nesting in Missouri River banks with soft sand layers allowing excavation of nest holes in South Dakota from the Nebraska boundary as far north as the North Dakota border (Olson 2009, Drilling et al 2016). Nesting data for the five-year period 1985-89 (Bennett 1986, 1987, 1988, 1989, 1990) indicate that this species reaches its peak abundance as a breeding bird in the southwest; a total of 221 nests were reported, including 78 in Lincoln Co, 48 in Frontier Co, and 14 in Hitchcock Co. Other studies (Wingfield 1982, 1983, 1984, 1985; Linderholm 1987) showed a similar spatial distribution. A total of eight birds were at Red Willow Reservoir SRA, Frontier Co 7 Jun 2006, and a nest under a bridge in Deuel Co had eight young 10 Jun 2006. Elsewhere in the west, breeding has occurred regularly at Crescent Lake NWR, Garden Co where as many as 11 were counted 6 Jun 1995, and five were roosting in a willow thicket there 8 Sep 1997. This population may have been at least augmented by a NGPC captive breeding and reintroduction program started in 1980, using nest boxes on the refuge (Hancock et al 1981, Lock 1980, Huber 1987). In 2017, three nest boxes were occupied 5 May 2018. In Keith Co, a notable report was of 12 birds in two family groups using holes about a mile apart in a canal embankment between Roscoe and Paxton 25 Jul-9 Aug 2014. One was in a cut-bank hole in Sioux Co 17 Aug 2008. As indicated above, reports in the northeast are recent. At least three sites near Creighton, Knox Co have been occupied since 2005, one continuously, with grain bins favored; in 2015, a nest at Ponca SP, Dixon Co was discovered 9 Jun and had seven young 31 Jul and three nestlings and four fledged young nearby on 13 Aug and fledged six of the seven chicks (Spilker and Gubanyi 2017). Pellets were collected from this nest site and analyzed for diet composition; a surprising finding was that 39% of the diet consisted of a small species Western Harvest Mouse (Rheithrodontomys megalotis) that would require multiple captures for maintenance of body weight, whereas 32% consisted of two vole (Microtus) species, which are about four times as heavy (Spilker and Gubanyi 2017). A nest at Ponca SP in 2018 had 3 nestlings 18 Aug, two on 2 Sep (BFH). A brood of seven chicks about two weeks old in a grain bin in Platte Co was removed prior to the bin being emptied 22 May 2012. A likely family group of four was at a Dodge Co farm 25 Aug 2013. The only other reports in the extreme northeast are of a road-killed bird 31 Mar 2005 Pierce Co, one on 29 Apr 1990 Cedar Co, one on 18 May 1995 Wayne Co, and one in a farm barn in Stanton Co 10 Apr 2018. In north-central Nebraska, east of the Panhandle, one near Berwyn, Custer Co had seven young, at least four of which had fledged by 19 Aug 2010. A brood of seven in a grain bin was photographed 15-20 miles east of Chambers, Holt Co during Aug 1999 (Loren “Bub” Blake, personal communication). It was considered a rare summer resident at NNF Bessey, Thomas Co by Bray (1994). Three fully-fledged young were observed in 1985, where nesting had occurred several years prior, at the U.S. Fish and Wildlife Service fire tower at Valentine NWR, Cherry Co (Wingfield 1985). There are no nesting reports since, although there are two fire towers still present as of 2017 (Juancarlos Giese, personal communication). There are two other reports in Cherry Co: one in a cut bank east of Valentine 8 Sep 1984 and one south of NNF McKelvie 12 Aug 2013. Further south, one was at Calamus Reservoir SRA, Loup Co 24 May 1997, and one was near Broken Bow, Custer Co 19 Apr 2012. In the eastern Rainwater Basin, Jorgensen (2012) considered it a “rare spring and fall migrant and breeder”. Breeding occurred at Ulysses, Butler Co 2005-2008 in an old school building (Mollhoff 2006, Silcock 2006, 2008). Three broods were brought to Fontenelle Forest Raptor Recovery in 2014 at remarkably late dates: 15 Oct and 31 Oct from Keith Co, and 6 Nov from Buffalo Co. A study in southwest Nebraska found that 86% of eggs in 47 nests hatched late May-early Jun (Linderholm 1987). Most of the Nebraska population departs in Oct, although occasional late broods (see Breeding Phenology) would account for lingering birds. Later reports through Nov are 26 Oct 2009 North Platte, 9 Nov 1965 Adams Co, and 29 Nov 1975 Sherman Co (see Winter). Winter: Some authors consider this species resident in Nebraska (Tout 1947, Marti et al 2005), although there are no documented reports of overwintering individuals. In Nebraska, which is near the north edge of the species’ breeding range, most individuals probably depart prior to winter. Bent (1938) indicated that banding data show often-extensive movements which suggest migration, although Marti et al (2005) considered that generally the species is sedentary except for “some regions of the northern US.” A Barn Owl banded (band # 987-63280) at Fort Calhoun, Washington Co, Nebraska 22 Sep 1982 was recovered near Monroe, Wisconsin 11 Jan 1983. There are only about 30 records Dec-Feb, only these eight since 1980: 6 Dec 2011 Rowe Sanctuary, Buffalo Co, 15 Dec 1984 Dakota Co, 19 Dec 2003 Johnson Lake SRA, Dawson and Gosper Cos, 28 Dec 2006 photographed Lake McConaughy, Keith Co, Jan 2006 call heard along the Niobrara River, Cherry Co and compared to recordings (James Ducey, personal communication), 1 Feb 2003 found dead in good condition in a barn Wayne Co, 14 Feb 2018 Furnas Co, and 20 Feb 1981 Colfax Co, two found dead (Peters and Schmidt 1981). Barn Owl (barely visible) in nest burrow in road cut-bank, Red Willow Co 1 May 2015. Photo by Joel G. Jorgensen. Photograph (top) of a Barn Owl in a nest box at Crescent Lake NWR, Garden Co 28 May 2012 by Phil Swanson. Bennett, E.V. 1988. 1987 Nebraska nesting survey. NBR 56: 35:40. Bennett, E.V. 1990. 1989 Nebraska nesting report. NBR 58: 38-45. Drilling, Nancy E., Robert A. Sparks, Brittany J. Woiderski, and Jason P. Beason. 2016. South Dakota Breeding Bird Atlas II: Final Report. Tech. Rep. M-SDBBA2-07. Bird Conservancy of the Rockies, Brighton, Colorado, USA. Hancock, B., J.E. Ducey, and R. Lock. 1981. Captive breeding of Barn Owls in Nebraska- initial efforts. NBR 49: 31-33. Linderholm, B. 1987. Southwest Nebraska Barn Owl project report. Report submitted to the Nebraska Game and Parks Commission, Lincoln, Nebraska, USA. Lock, R.A. 1980. Barn Owl management plan. Nebraska Game and Parks Commission, Lincoln, Nebraska, USA. Olson, R.D. 2009. Barn Owl distribution on Lake Oahe. South Dakota Bird Notes 61: 5-7. Peters, K.L., and R.H. Schmidt. 1981. Barn Owls. NBR 49: 25. Spilker, A., and J. Gubanyi. 2017. Diet and habitat analysis of Barn Owls (Tyto alba) nesting at Ponca State Park. NBR 85: 121-127. Wingfield, G. 1982. Barn Owl investigations – 1982. Nebraska Game and Parks Commission report, Lincoln, Nebraska, USA. Wingfield, G. 1983. Barn Owl investigations – 1983. Nebraska Game and Parks Commission report, Lincoln, Nebraska, USA. Wingfield, G. 1984. Barn owl nesting investigations in western and central Nebraska – 1984. Nebraska Game and Parks Commission report, Lincoln, Nebraska, USA. Wingfield, G. 1985. Barn owl nesting investigations in western and central Nebraska – 1985. Nebraska Game and Parks Commission report, Lincoln, Nebraska, USA.